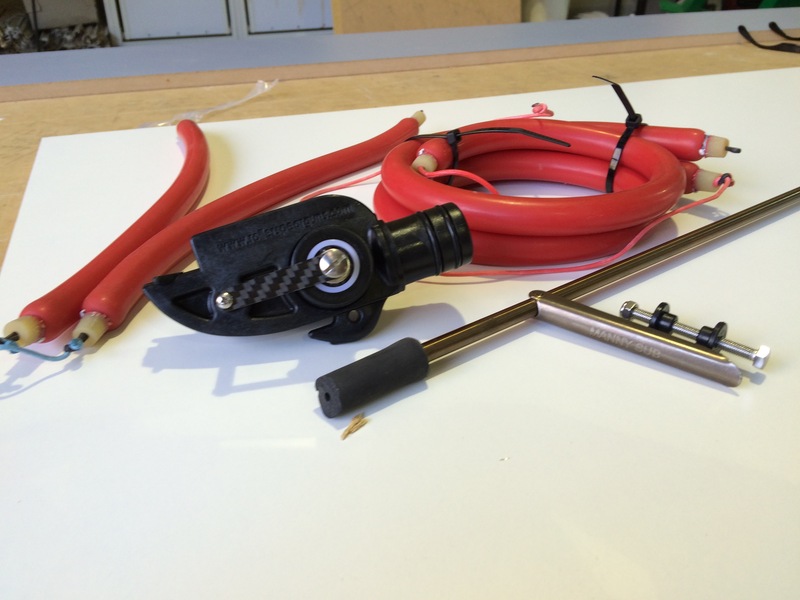 Preparing for a Spearfishing trip, 4 things I wouldn’t normally do. My preparation for this trip was a little different to my others due to the nature of the preceding months. Firstly I had just recovered from ciguatera poisoning and I had only been diving twice in about 5 months. I was down on weight (65kg) and I had bugger all strength, breath hold or any dive fitness therefore I needed to focus on getting my body right as best I could in my short lead up time. I didn’t focus too much on spending money on gear though I did buy a Roller Power Head conversion kit. I ‘m of the mindset that there’s a lot of personal improvement to be done to get the most out of your equipment, your body being one of these things. I had about 5 weeks between being well enough to start pushing my body and setting off for the trip. So here’s what I did, perhaps this will help you when preparing for a spearfishing trip. Normally I would get stuck into cardio training before a trip. Hill runs and stair sprints usually with some kettle bell in there as well but this time I hit the gym. One of my major issues with diving is my poor finning technique and fatigue in my legs (compounded by ciguatera and lack of diving) which Wayne Judge has identified before (it’s on camera and it looks ugly). Some of this I put down to weak ankles and leg muscles. I have the common tendency of rolling my ankles inwards when I fin and it gets worse when I’m fatigued. As my ankles roll inwards so too does the blade of the fin and therefor doesn’t catch and channel water down the length of the blade but spills off the blade making for inefficient technique. On top of this I tend to bend my knees too much creating drag which decreases efficiency. I have an excellent set of Penetrator carbon fibre blades that I’m not utilising to their full potential due to poor conditioning and lack of strength. I visited my strength and conditioning coach and she prescribed me a simple but effective routine to give me some ballast in my lower quarters (nautical pun intended Arrrrrr!). She also worked out my top half for a bit of cleavage when getting glamour shots with fish and swimming after and man handling big Dog tooth tuna which never happened. Twice per week, two sets of 10 each, with 1 minute 30seconds rest between each set. Keep in mind I’m a gym novice and she kept this very simple for me. 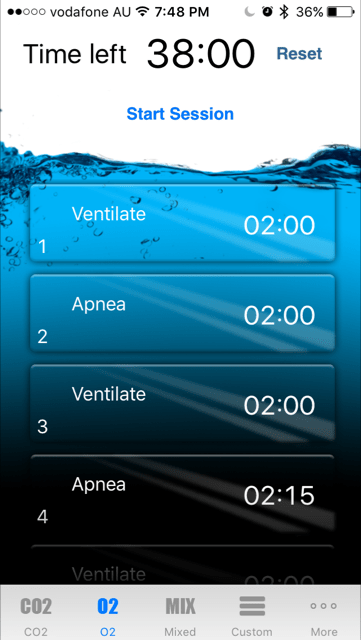 I used the I Hold Breath app to create custom O2 and CO2 tables based on the five minute free diver. When preparing for a spearfishing trip I would normally I would link up with Wayne Judge and his training squad (Brisbane Bulsharks) to get some pool training in but due to time constraints, health and work commitments I just couldn’t get there. I stumbled across the five minute free diver course by Pete Ryder and committed to the one month challenge of a five minute breath hold. The course concentrates on oxygen tables (O2) and carbon dioxide (CO2) tables as well as sprints for Vo2 max. Training initially starts out with CO2 tables to improve carbon dioxide tolerance then switches over to O2 tables to improve oxygen utilisation efficiency. Throughout the entire month interval sprint training is interspersed to improve Vo2 max. Over the month the intensity of the tables increase and really begin to push your limits. The butcher splits the beast with a chainsaw. Our trip to the Coaral Sea was not chartered. We took our own boat, our own supplies and relied completely on ourselves for everything. That meant we needed enough food for four blokes for two weeks. With my Ciguatera poisoning just clearing up before we left I couldn’t take the risk of relying on just fish to eat. Fortunately my family has a farm and we run cattle and sheep, so with ice boxes in hand it was off to the farm for some meat. There is something satisfying about the complete cycle of paddock to plate. Spearfishing too has this appeal and puts us squarely back into the food chain and connects us to our food. I think the disconnect between our food due to urbanisation is a major problem within our society and a driving force behind waste and pressure on the environment. We called the farm butcher in and killed eight lambs and a steer of which we took a whole lamb and some beef. 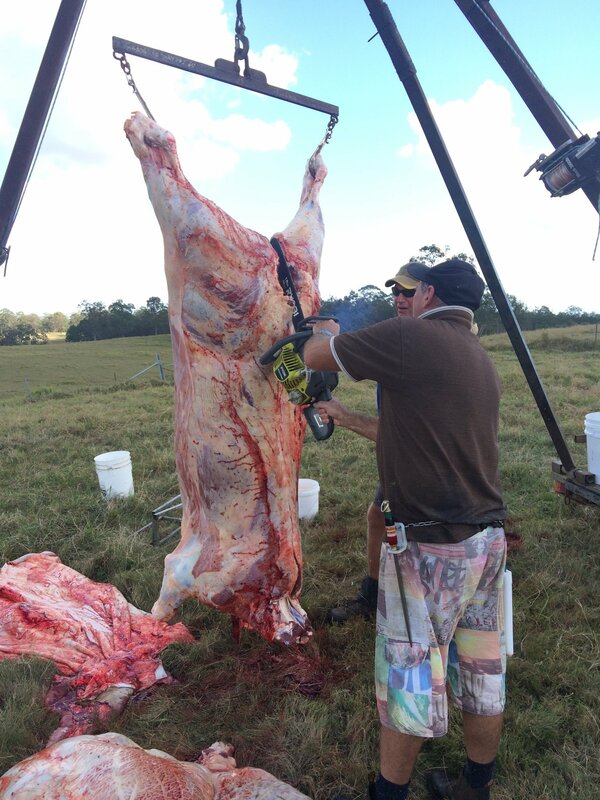 It doesn’t get better than grass fed meat fresh from the paddock and it feels pretty luxurious steaming through 3m swell with a roast lamb in the oven. No.4 One gun to rule them all. So there it is, four things I wouldn’t normally do when preparing for a spearfishing trip. Would I do them again? you bet I would. Improved fitness, breath hold, gun and bulk meat in the Coral Sea…. PERFECT!